Have you ever wanted to pre-define your trading analysis? Using the PFA ZoneSuite you can do just that. We have designed a unique algorithm to calculate where Order Flow (Buy and Sell Orders) may potentially reside and plot it on your chart automatically with multiple time frame functionality. 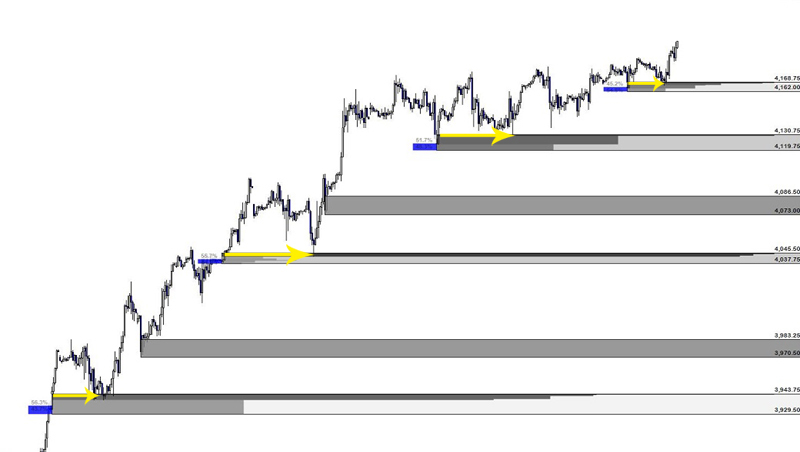 See zones from the large time frame, and the smaller time frame all from one chart! This helps in many ways including preparation, exact user-defined entry/stop/target points, and gives you extremely visual aspects that are reoccurring which increases consistency. The PFAZoneSuite can be used on multiple markets and time frames simultaneously. We have defined our methodology to remove most subjectivity within your trading analysis by very easy to follow tactics, like color changes and opacity. This has many benefits to your trading analysis whether you day, swing, position, or long term trade even beyond exact user-defined entry/stop/target points. With our custom design you'll have visual reminders of potentially high volume areas. Each zone is calculated, then put thru an extensive set of algorithms to determine high probability analysis while disregarding others. This helps generate more consistent analysis and reduces time for manual calculations. Our algorithms can be incorporated into any trading method as an analysis tool, and help you reduce subjectivity! As you know the markets can move up, down, and sideways. If you don't have a complete methodology that gives you opportunities in all market conditions, you may sit out of trading more than you like and potentially lose a lot of your capital. The PFA ZoneSuite can help you analyze multiple market conditions up, down, and sideways. An economic model of price determination in a market. It concludes that in a competitive market, price will function to equalize the quantity demanded by consumers, and the quantity supplied by producers, resulting in an economic equilibrium of price and quantity. This refers to areas in which an extreme imbalance in price occurred. This imbalance has taken place due to the extreme off set of equilibrium as displayed below. Our custom software attempts to define these areas with specific calculations. As seen above our software can be used in a sideways market on a small and large time frame. However depending on your trading preferences, you may choose to only trend with the market on a larger time frame. This is a very high probability method of trading. Displayed below you can see how using the ZoneSuite on a larger time frame will attempt to pick out some of the best areas for trading volume to potentially take place. Others may enjoy trading the small time frames and taking very short term trades. 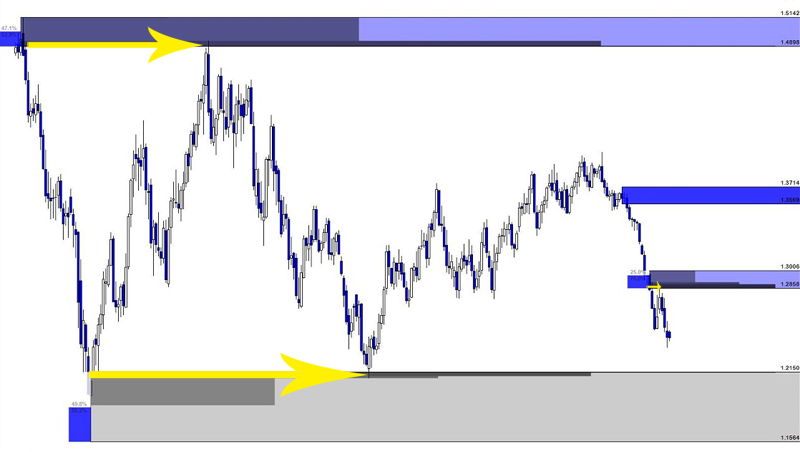 Below you will see a small time frame in which the PFA ZoneSuite continues to display high probability areas for trading volume to potentially take place, and display the zone(s) with specific numbers. Alleviating the subjectivity and/or discretion from trading with zones is crucial for many, especially as they learn to read price and it's upcoming direction. 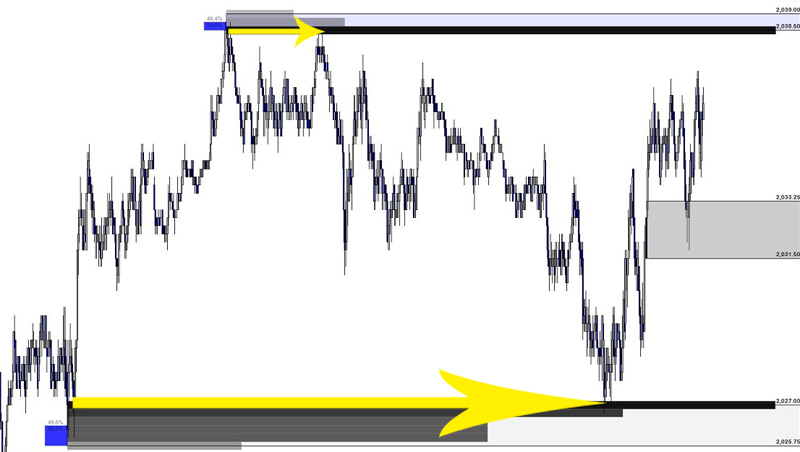 Using our custom software algorithms the Fully Automated SD Model allows you to test your trading analysis. The SD Model uses a unique combination of software which has user-defined risk management, trend direction and includes push button back testing, and optimizing for your price action analysis.